Spektakulær udsigt over Casa de Campo Dye Fore golfbane fra denne rummelige tre soveværelser, tre bad penthouse ejerlejlighed. En nybygget enhed, der skånede ingen detaljer i udsmykning, indeholder et soveværelse med dobbel størrelse med eget opholdsstue. Moderne bekvemmeligheder såsom bredbånds wi-fi internet, central air condition og iPOD docking station. Infinity pool, jacuzzi og grillplads. L'Occitane badeværelse bekvemmeligheder! En golfspiller drøm bliver til virkelighed, dette moderne luksuriøse condo kommer med en fuld tid pige, der kan udføre lys madlavning efter anmodning. Inkluderer adgang til et moderne førsteklasses motionscenter lige ved siden af. Alle faciliteter på Casa de Campo, daglige feriested gebyr gælder. This three bedroom penthouse condo in Los Altos is fantastic in every way. It is beautifully decorated and stocked with exceptional quality household items and any item you could possibly need. Raquel, the housekeeper/cook is fabulous. She maintains the condo impeccably, is a great cook and a pleasure to deal with. She set the table beautifully for every meal and made great efforts to communicate with us, as we have limited ability to speak Spanish. Bob, the owner, was a pleasure to work with. He was responsive to all our requests and communications. The main balcony overlooks the 16th fairway on the Dye Four course and provides a beautiful setting for any meal or just relaxing. The furniture and decorations are even better than the photos on the VRBO site. We plan to stay here again next year. We thoroughly enjoyed our short stay in this beautifully decorated condo. Bob was great to work with- lots of recommendations for things to do and prompt answers to my many questions. We spent hours on the fantastic porch with the views of Dye Fore golf course and enjoyed Racquel’s breakfasts and taking care of us. Only suggestion I have for improvement is more light in the master bath upstairs - other than that it’s a great place to stay and only a golf cart ride away from Altos de Chavon and all the other amenities of Casa de Campo! Thank you for the nice review! Great suggestion on the additional light in the Master bathroom, we will do that in all the bathrooms. Looking forward to welcoming you back soon. We enjoyed our stay in this condo in casa de campo however we did find it to be soooo far from the hotel, beach, marina etc. Basically from all the amenities that we used during our stay. It is close to the golf course and Altos de Chavon. So I can see how it is good for golfers. Raquel- the cook was fantastic and extremely friendly. Bob was also a pleasure to work with. From the moment we arrived we were delighted with the condo. Raquel, the housekeeper, was there to greet us and help us get settled. She made us feel at home immediately and saw that we were comfortable. In my opinion, the pictures do not do justice to this condo which is beautifully furnished and appointed. The views of the golf course were lovely and the pool was under our window. Also, Altos de Chavon, which is so charming, was within walking distance so we were able to go there for dinner. Raquel is a good cook and we ate a delicious dinner at home on two nights. We communicated our food preferences and other requests successfully even though we were not fluent in Spanish and everything went very well. We look forward to returning next winter. Thank you for your kind words and 5-star review. I will share you comments with Raquel our maid/cook who takes great pride in making sure every visit is just right. We looking forward to welcoming you back soon. In the meantime we will get better pictures taken! We stayed here over our wedding weekend in Casa de Campo. The pictures of this place don't do it justice. It is gorgeously decorated, the master bedroom is HUGE with double height ceilings, and the other two bedrooms are very comfortable. The finishes of the apartment complex and the landscaping are jaw-droppingly beautiful! Bob and Leandro were always available to help and to answer questions. Raquel, their housekeeper, was very sweet and came during the day to help and to clean without being intrusive. I highly recommend visiting this property! Beautiful, spacious and private tropical paradise! Bob is the most helpful, gracious and friendly host I have ever encountered. Need more golf carts? No problem!. Need something fixed? I'll send someone yesterday! My party loved the location, the pool, the privacy, the help and the space. Compared to a villa, it's a veritable bargain. 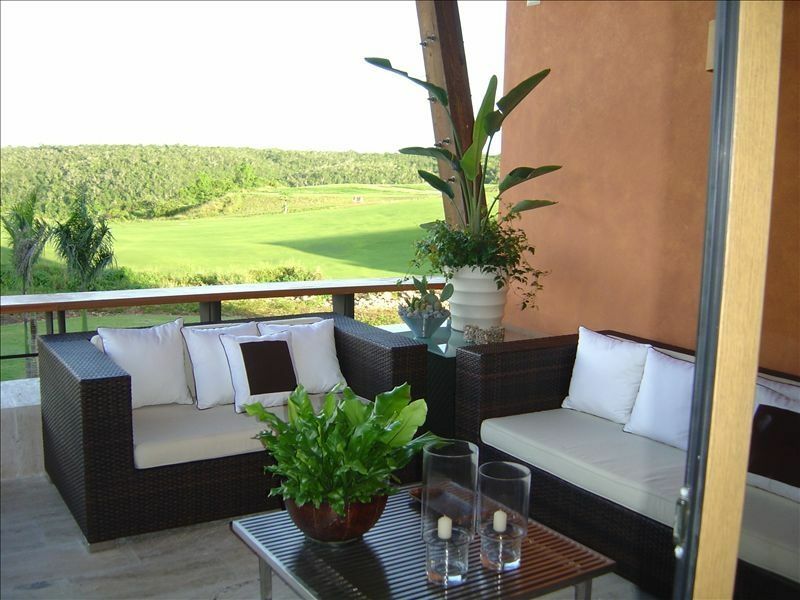 I would not hesitate to rebook this apartment for future stays at Casa de Campo. One note. Renting a car for this location is highly recommended. Avis' dropoff and pickup service is excellent. Thank you for your nice comments. We always strive to ensure that each of our guests has the best experience possible and love being there as much as we do. It was our pleasure to host you and we look forward to welcoming you back soon ! Includes daily full time maid. Note that a Casa de Campo resort fee is paid directly to the resort and not included in the rate.